Five months after the subpoenas were issued, Republicans in the state legislature are criticizing the NC elections board for reacting slowly. In a public letter signed Jan. 29, Reps. Holly Grange of New Hanover County and Destin Hall of Caldwell County called on the board to comply with the request. But the letter, released through the office of House Speaker Tim Moore, makes several claims that are misleading or lack context. The elections board “declined to comply with grand jury subpoenas.” In September, the bipartisan board voted unanimously to try to quash (meaning block or limit) the subpoena, authorizing the office of Attorney General Josh Stein to work on the board’s behalf. Why quash the subpoena? The board believes it is “overly broad, unreasonable, vague, and clearly impacts significant interests of our voters,” according to a statement issued in September by Josh Malcolm, the board’s vice chairman at the time. Malcolm noted that the board over the past five years had “routinely referred matters to the Eastern District of North Carolina for investigation, even when not required by law, policy or otherwise.” But the August subpoena was “an overreach,” he wrote. What’s the status of the legal tussle? Stein’s office is in “regular conversation with the U.S. Attorney’s office,” Stein spokeswoman Laura Brewer told PolitiFact on Jan. 29. And the elections board believes those talks will ultimately lead to a subpoena requiring “a much smaller set of records than initially sought,” according to elections board director Kim Strach, who responded to Grange and Hall in a Jan. 29 letter. Considering Stein’s office is in talks with Higdon’s office about the scope of the subpoena, it’s misleading to say the elections board “declined to comply” with it. Federal officials “extended the deadline for your compliance.” This is true. Higdon’s office originally sought the NC elections board documents by Sept. 25. However, after speaking with the elections board, the office extended the compliance date to January 2019. And the subpoena paperwork doesn’t say why the records were requested. The subpoena was requested by ICE, an agency that has worked on cases involving elections but is better known for cracking down on those who violate immigration law. The subpoena says the elections board can comply by providing the materials to an ICE agent located in Cary. 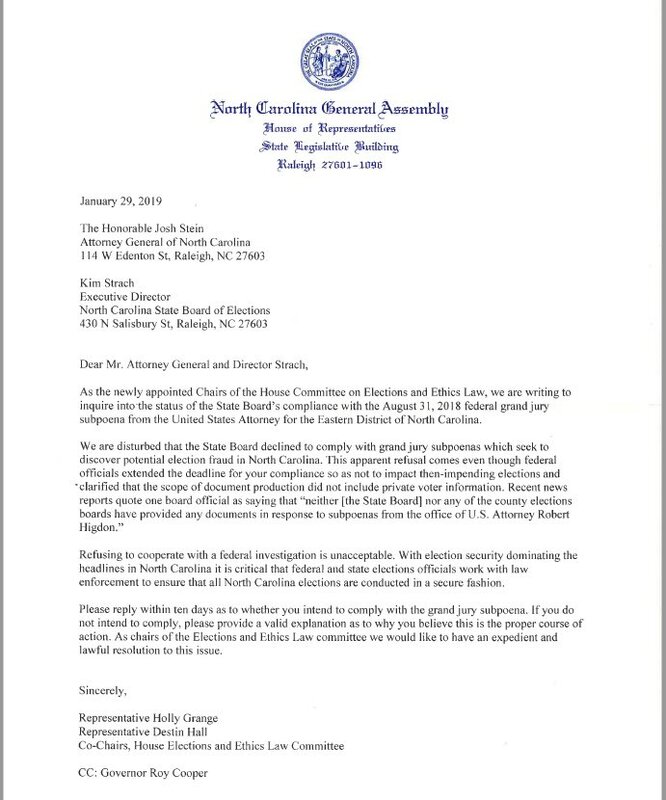 Grange and Hall’s letter could also lead readers to believe that the ICE request is related to the investigation into the 9th Congressional District election between Republican Mark Harris and Democrat Dan McCready. That investigation is ongoing, but we don’t know if the two are related. The subpoena was issued in August, before the election began. But the elections board was aware of voting irregularities in Bladen County (one of the counties in the 9th district) in the 2016 election. The request “did not include private voter information.” This isn’t true, according to the NC elections board. Higdon’s office requested eight types of documents. When the office extended the deadline to comply, it authorized votes to be redacted from ballots. And a lot of other voter data — including a voter’s address and voting history — is publicly available on the elections board website, Hall and Grange noted. But some of the other documents requested sometimes include a person’s Social Security number, date of birth, driver’s license number or signature, according to elections board spokesman Pat Gannon. “The subpoenas as written sought information deemed confidential under state law,” Gannon wrote in an email to PolitiFact. PolitiFact doesn’t know whether the elections board will redact that information, or try to withhold those documents altogether. “The State Board plans to respond to the subpoenas based on advice from our counsel at the Attorney General’s Office,” Gannon said. Grange and Hall have a point: The elections board has yet to provide the requested documents to Higdon’s office, even though its deadline to comply was extended. However, the legislators mischaracterized the subpoena and the board’s reaction to it. The board’s representatives are communicating with Higdon’s office about the scope of the request. Contrary to Hall and Grange’s claims, the motivation for the subpoena hasn’t been revealed publicly, and the subpoena seeks private information. The board seems unlikely to respond to the full subpoena, but it hasn’t wholly refused to comply.